Hanover Engineering was retained by Lehigh Valley Industrial Park, Inc. (LVIP) as their site engineer for the design and development of a 248-acre industrial park. The park is located in Bethlehem along Route 412, west of Shimersville Road, on the parcel referred to as the LVIP VII Saucon Tract. The park is constructed on lands of the former Bethlehem Steel Plant and contains 28 lots, one detention basin, and approximately 8,700 linear feet of new roadway. 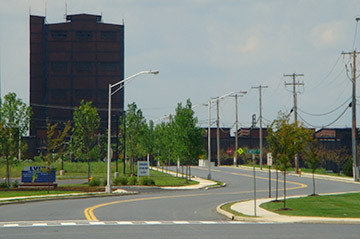 The Saucon Tract is Phase I of the more than 1,000 acre Bethlehem Commerce Center facility, which has been recognized as one of the largest brownfield redevelopment projects in the country. Hanover Engineering provided LVIP with engineering services throughout the project, including survey work, preparation of land development plans and highway occupancy permit plans, and design and permitting of the stormwater conveyance system and control facilities and other site utilities. Hanover Engineering also prepared the contract documents, assisted in the bidding and award of the project, and provided contract management and construction observation services during the course of all phases of the project. The project required coordination with the City of Bethlehem for the design and construction of the site’s infrastructure, including the rehabilitation of several large off-site storm outfall pipes discharging to the Lehigh River and the construction of one new outfall pipe discharging to the Saucon Creek. The project also involved coordination with the City and PennDOT related to the adjacent Route 412 Corridor Improvement project which was being designed at the same time as the park.